A group of religious-Zionist Bnei Akiva youth started organized prayers on behalf of Syrian civilians who are at risk due to the ongoing civil war in their country. The prayer initiative, which began with the Bnei Akiva volunteers who are doing a year of national civilian service in Petach Tikva, has now spread. . While Judaism teaches that any individual can pray to God and be heard, prayers said together as a group can have special power. The young volunteers also wished to have a formal prayer to say, in order to ask for divine mercy with the best possible wording. They asked Rabbi Yuval Cherlow, a leading figure in the religious-Zionist world and the head of the Petach Tikva hesder yeshiva, to help them find the ideal wording for their request for divine assistance for Syrian civilians. Rabbi Cherlow suggested that Psalm 37 and Psalm 120 would be particularly appropriate for the occasion. Both psalms speak of the plight of the innocent righteous when evil men plot against them. Rabbi Cherlow also wrote his own prayer, which is beautifully translated by Elli Sacks of Modi’in (be sure to give Sacks credit). Here is the original Hebrew. Read in English about story here. Though we are not accustomed to new formal prayers, we can no longer look at the slaughter taking place in Your world and fail to pray about it. Though we know that both sides in the war are guilty of wanton bloodshed, we are unable to keep silent when so many who are beyond the circle of conflict have fallen victim. In honor of the 50th anniversary of the “I have a dream speech,” here are selections from an unpublished BA thesis on the role of Orthodox Jews, Orthodox Rabbis, and YU students in the Civil Rights movement.It is not exhaustive because there were other Orthodox Rabbis such as Danny Landes of Pardes who spent the night in jail. On March 21, 1965, Reverend Dr. Martin Luther King, Jr. led thousands of marchers from Selma to Montgomery, Alabama in a political move that would ultimately lead to the Voting Rights Act of 1965. Though Rabbi Dr. Abraham Joshua Heschel’s presence at the front of the crowd has graced photographs of the event ever since, the story of Rabbi Saul Berman’s imprisonment in a Selma jailhouse just days before seems to have drawn a smaller audience. Rabbi Berman was arrested on the Jewish fast day of Ta’anit Esther, which fell that year on March 17. At nightfall, when the fast ended, Rabbi Berman was not able to break his fast on prison food, for it did not meet traditional Jewish dietary restrictions; a friend rummaged through Rabbi Berman’s suitcase and brought back the salami upon which Rabbi Berman was hoping to break fast. This friend also found another cylindrical item in the suitcase – a scroll containing the text of Megillat Esther, the tale of a Jewish girl who became queen of a massive kingdom and saved her people from certain destruction. Both the salami and the Megillat Esther proved to be of great use to Rabbi Berman: having broken the fast, Rabbi Berman celebrated Purim, a holiday commemorating the story of Megillat Esther, by reading the scroll out loud to “about 250 people” crowded into the jail. One can imagine the power reverberating throughout the room as a young Orthodox rabbi, far from his congregation, read an ancient narrative recounting the deeds of a Jewish queen who saved her people from an enemy within the government – a story that could easily resonate with a group of people hoping to save blacks from their own government’s voter registration prejudices. Just two years before, rabbinical degree in hand, Rabbi Berman arrived in Berkeley, California ready to work at Congregation Beth Israel. For the five years he served there, Rabbi Berman worked to better the rights of blacks in Berkeley and beyond. He returned to Berkeley after the 1965 Selma-Montgomery March determined to become more engaged with local civil rights politics. Though Berkeley’s high school was integrated, its lower education public school district lines were drawn in a way that separated white and non-white students. According to Rabbi Berman, two opposing forces were at work at once: one group wished to redraw the school lines so as to integrate the lower schools, while another group hoped to create a second high school that would essentially keep students segregated. Rabbi Berman primarily toiled to integrate the schools, though the community agenda additionally dealt with issues of free speech and, ultimately, the Vietnam War. Rabbi Berman’s colleague in New York, Rabbi Irving (Yitz) Greenberg, also contributed to the Civil Rights Movement. Along with his wife, Rabbi Greenberg first supported the Movement through donations to “various civil rights groups and voting for candidates that were sympathetic to the [Movement];” soon, the two were “attending rallies or special demonstrations” for the improvement of the status of blacks in American society. As a faculty member at Yeshiva University, a Modern Orthodox institution in New York City, Rabbi Greenberg took the opportunity to bring in speakers who discussed various aspects of the Civil Rights Movement. As a rabbi of the Riverdale Jewish Center, an Orthodox congregation, Rabbi Greenberg “spoke passionately” about the Movement’s necessity. In New York, Rabbi Greenberg was joined by the young Tsvi Blanchard, not yet a rabbi. Rabbi Blanchard was heavily involved by the late 1950s, and continued to take part in the Movement until the year after the 1965 Selma-Montgomery March. Splitting his time between college and yeshiva (a traditional Jewish institution of learning) in St. Louis, Rabbi Blanchard worked hard in Missouri and around his home in Rochester, New York to further the Movement’s goals. In St. Louis, he “was involved in redeveloping areas of the black ghetto.” In addition, Rabbi Blanchard participated in the boycotting and picketing of Woolworth’s and Eastman Kodak. The Woolworth’s story is fairly well known: in 1960, four black students started a sit-in at a Greensboro Woolworth’s to protest segregated seating; within weeks, the “Greensboro four” had inspired sit-ins and picketings across the country. In contrast, the Eastman Kodak narrative dealt with employment issues: Rabbi Blanchard joined Saul Alinsky, community organizer extraordinaire, to challenge Rochester’s Eastman Kodak to hire more black workers. At the same time, Rabbi Blanchard involved himself in “a whole series of various and sundry picketings of racist speakers,” and supported “black self-organization efforts” such as those surrounding the Kodak protest. The Selma-Montgomery March both highlights and marks the final stage of Rabbi Blanchard’s activity in this paper’s time period. Even the South, homeland of the Jim Crow laws and their overt supporters, hosted at least two Orthodox rabbis who quietly worked to promote the message of the Civil Rights Movement. One rabbi from Atlanta chooses to remain anonymous, but writes that he participated casually throughout the time period; for instance, he would occasionally deliver sermons supportive of the Movement. At times he would host observant Jewish activists who had recently been released from jails in Atlanta, Birmingham, Montgomery and elsewhere. Finally, this rabbi took part in “informal discussion groups” on the matter. Another Southern rabbi, Rabbi Louis Tuchman of Durham, North Carolina, followed a similar pattern. Though his congregation hired him specifically because he was not a Civil Rights activist, Rabbi Tuchman was preaching pro-integration by 1957. He specifically incorporated the themes of freedom during the Jewish Purim and Hannukah holidays, relating the holidays to the black quest for full integration. Unfortunately for Rabbi Tuchman, that same year his congregation moved to the suburbs and to Conservative Judaism. Rabbi Tuchman and his anonymous colleague in Atlanta deserve special recognition for their work. According to Mark Bauman, fewer than forty Orthodox rabbis served congregations in the South in 1954. The states of “Alabama, Arkansas, Kentucky, North Carolina, and Mississippi…claimed a total of three Orthodox rabbis,” and no Orthodox rabbis served Florida communities apart from those in Miami and Miami Beach. Bauman posits that the “limited” involvement of Orthodox rabbis in the South corresponds to the small number of Orthodox rabbis actually present. This theory relies upon only one incidence of Orthodox involvement noted in his book’s collection; however, one cannot ignore the fact that some forms of informal involvement may prove quite difficult to trace. For instance, more than one or two Orthodox rabbis may have presented this controversial topic to their congregants through holiday sermons. Since participation in the Civil Rights Movement can include actions outside of a certain model of 1960s volunteering, the judgment of ‘limited’ involvement may be based upon somewhat incomplete evidence. Some, such as Chicago’s Rabbi Ahron Soloveichik, were better known; this leading Orthodox scholar passionately discussed the basis for equality in halakhah in the keynote address at a national convention for Orthodox affiliate Young Israel. By 1964, supposedly motivated by competition for “allegiance of the young” liberals flocking to Conservative and Reform denominations, the Rabbinical Council of America publicly declared its support for the Civil Rights Movement. Young Israel, another Orthodox group, had already backed the Movement in a 1962 editorial. The Orthodox Union, in turn, preceded Young Israel by agreeing with a “strongly liberal” plan for “civil rights and civil liberties” in the 1950s, and it continued to support the “civil rights gains of blacks” throughout the 1960s. Without question, YU students actively discussed the Civil Rights Movement, though not necessarily right away. The record for the 1950s is largely silent on the matter, and aside from late-night dorm-room conversations and a short editorial despairing over the bigotry extant at the University of Alabama, there may not have been much debate over the plight of blacks in America. However, analysis of student publications shows that by the beginning of the 1960s, students often discussed and educated themselves about the Movement. For instance, in 1961, Stern students listened to a Nigerian leader maintain the need for blacks and whites to work together. They later had the opportunity to hear the administrative assistant of the NAACP’s Executive Secretary speak about the history, purpose, methods, and goals of that prominent organization. In 1964, the YC Yavneh, an “Orthodox Jewish students organization,” hosted a panel on the Civil Rights Movement. An entire supplementary edition of The Observer was dedicated to questions on the causes of black rioting, theoretical solutions to help alleviate racial tension, comparisons between blacks and Jews in the United States, and comparisons between blacks and Israeli-Arabs. In fact, from 1967 onwards, black rioting and episodes of black anti-Semitism clearly affected the rhetoric on campus. Musing over the previous summer’s black riots, one YC student wondered whether there was any possibility of calming the revolts. The editor of HaMevaser, the “official student publication of the religious divisions” of YU, acknowledged that SNCC had rejected Jews, yet felt that “a true religious person” could not blame all blacks for the actions of SNCC and its partners. Another Observer supplementary edition addressed issues of Black Power, Jewish racism, Jewish withdrawal from the black-Jewish dialogue, and black anti-Semitism. That same month, the grassroots campus publication Pulse published an author who was discouraged with the fact that black rioting and anti-Semitism had led some Jews to equate the push for black equality with extreme violence and fear, and thus to unsettling memories of the Holocaust. Rather than step away from American black society, this author hoped to encourage interracial discourse and the dissolution of negative black stereotypes among Jews. Still another student, disgusted with the turn of events, claimed that the Civil Rights Movement had generated a “Frankenstein” of violent militants. YU students did not simply discuss the Civil Rights Movement; they also actively pursued its goals. For example, in 1960, YU was a member of the Metropolitan Students for Non-Violent Civil Rights Action, and YU students protested Woolworth’s Southern lunch counter policies by picketing and distributing leaflets in front of a New York branch. The next year, YU students started a tutoring program in a local public school; this program served as a model for other colleges. One wholeheartedly dedicated Stern student published her memoirs of the March on Washington, where Reverend Dr. Martin Luther King, Jr. gave his famous “I Have a Dream” speech; she later reported on a Washington, D.C. conference on apartheid, Southern segregation, and Northern discrimination. This student soon worked with other Yavneh leaders to organize a “mass boycott of New York City public schools,” in which Yavneh members taught freedom schools and picketed throughout Harlem and Washington Heights. In fact, YU even donated the use of one of its buildings for the endeavor. By the late 1960s, over 100 YC students were tutoring through the Yeshiva University Neighborhood Youth Corps (YUNYC), and SC started its own version of the same. YU as an institution encouraged a positive perspective on the Civil Rights Movement. In 1961, it awarded an “honorary Doctor of Laws degree” to Chief Justice Earl Warren, who was quite influential in the 1954 vote to end segregation. In addition, its medical school application did not ask for a photograph, and thus had color-blind admissions. This fact is noteworthy in a country whose medical schools were not fully open to blacks until 1966. Starting in 1969, the medical school’s King-Kennedy Medical Program subsidized lower-income blacks as they prepared their pre-medical curriculum, so that they could later improve medical care in their ghetto communities. That same year, a black Jewish YC freshman discussed his identity in The Commentator; clearly, a black Jewish student in the College was not only tolerated, but openly accepted. Though the institution seems to have acknowledged certain values of the Civil Rights Movement, a vocal group also begged its contemporaries to work with caution. For instance, one student responding to the Woolworth’s protest unashamedly critiqued the Student Council for officially backing the picketing: because of this backing, the Student Council had turned YU students into unwilling representatives of all East-coast Jews. Rabbi Lichtenstein, a major figure in the school, felt that Orthodoxy’s slow response to issues such as the Civil Rights Movement was due to an appropriate sense of prudence; still others felt YU could not afford to critique society publicly when it was just proving the possibility of living religiously and functioning fully within America. Yet another group of students may not have formulated extensive opinions on the Civil Rights Movement at all. Throughout the timeframe, The Commentator and The Observer published articles scorning the supposedly commonplace apathetic student lifestyle. Whether deriding the student body for voting half-heartedly, if at all, in the Student Council elections, or simply condemning students for displaying “indifference” towards non-academic activities, student leaders at SC and YC despaired over the seemingly “contagious” apathy displayed by their classmates. This laziness does not necessarily point to an entire generation of bookworms. In May of 1961, The Observer reported that nearly half the graduating class was already married, and two women had already borne children. Interest in femininity encouraged the young women to bring a special instructor on “posture, hair care, make-up, and fashion” to the school three times during the 1963 to 1964 school year. People seemed to like the Jewish- Derwish photo from 1922 but there is much more Jewish-Sufism out there, even beyond Bahye or Avraham b. Maimonides. The scholarship for the last half century on the family of Moses Maimonides has produced a new shelf of books in halakhah, letters, exegesis, and Sufism. And we have works by those who followed them or asked them questions. Those who published the material are publishing the texts for the first time from manuscript and are dedicated to editing other manuscripts. Currently, there is no synthetic work bringing all this data together in order to provide a narrative of the 250 years of Egyptian Jewish intellectual life after Maimonides. Here is a text David ben Joshua Maimonides or ibn Maimoni, that would be 1) Maimonides 2) son- Abraham (Nagid) 3) 3rd generationDavid (Nagid), Obadia (The Treatise of the Pool) 4) 4th generation Abraham 5) fifth generation Moshe (Nagid),Joshua (Nagid), and finally 6) six generation David (Nagid) 14th-15th century). Nagid David’s Al-Murshid ila al-Tafarrud wa-l-Murfid ila al-Tajarrud, was translated by Fenton into Hebrew as Maqalat fi derek ha’Chasidut, and also into French. The work guides the individual through the“spiritual stations to the exalted plane of Chasidut;” “it is the spiritual itinerary of the devotee which culminates in prophetical gnosis.” This work, Fenton explains, is “thoroughly imbued with Sufi ideology and terminology.” Finally, we see amongst the vast library of works attribute to Nagid David, that the work of Ibn al-`Arif (1088 – 1141) is cited as part of the collection of his copyings. In the Cairo Geniza shows from the numerous copies the famous Sufi Al-Hallaj (c. 858 – 922) and the writings of ibn al Arabi. A Genizah letter addressed and answered by Nagid David tells of Jews attending the meditation and zhikr (Heb: hazkarah) retreats of Sufi Shaykh Yusuf al-`Ajami al-Qurani (d. 1367), who supervised a zawiya hermitage on the Qarafa as-sugra Muslim cemetery east of Cairo. For more, see Fenton, Paul B.. “The Literary Legacy of David ben Joshua, Last of the Maimonidean Negadim.” The Jewish Quarterly Review 75, 1 (1984): 1-56. Now here is a quote from Nagid David when he developed a Jewish-Sufi version of Suhrawardi’s concept of illumination through luminous intuitions, divine sparks, and mental flashes. This state is attained through constant contemplation, intense remembrance of God, and diminution of food and sleep. Thereupon, these lights shine upon his pure heart and an irradiance awakens an inner desire to receive this divine blaze and angelic flashes. For more on Persian mystic Suhrawardi (1151-1191)- see a website dedicated to him here, and Stanford E of P here and wiki here. And for those looking for Tishrei reading- here. We dont have a photograph of Nagid David in his Dervish clothes. Of the first station [of the spiritual path] which is that of illumination (zehîrût). The Hebrew term zehîrût (‘meticulousness’) can have two meanings. Firstly, it can signify ‘scrupulousness’, through striving to reach the goal by deploying painstaking efforts or by abandoning thoughtlessness and renouncing a life of leisure. Secondly, it can signify ‘enlightenment’ as in the expressions of brightness (zôhar) in the verses ‘The Enlightened will shine as brightness of the firmament’ (Dan. 12:3), and ‘brightness as the colour of amber’ (Ezek. 8:2). Hence the term zehîrût designates illumination and the individual who reaches this station is called zâhîr or ‘illuminate’. The latter refers to the seeker of the soul’s enlightenment and the spirit’s illumination through luminous intuitions, divine sparks, and mental flashes. This [state] comes about through constant contemplation of the angelic world, intense remembrance of God, subtle meditation of the world of sanctity, and diminution of food and sleep. Thereupon, these lights shine upon his pure heart in accordance with his progress through the successive stages and stations, each more noble and exalted than its predecessor. For spiritual effort and illumination lead to further enlightenment and irradiance, awakening an inner desire to receive this holy effulgence, divine blaze and angelic flashes, and inciting the individual to prepare himself for their encounter. Each arousal is conducive to illumination and each illumination is conducive to further arousal. On this account our Sages stated: ‘illumination leads to zeal’ (TB ‘Abodâh Zârâh 20b), i.e. this station is conducive to the following one. The present text is a translation from the Judaeo-Arabic work al-Murshid ila t-tajarrud or ‘Guide to Detachment’ by David b. Joshua Maimonides (Egypt circa 1335-1410), last known nagîd (community leader) belonging to the famous Maimonides’ dynasty. The Guide to Detachment is a practical manual for the spiritual life divided into progressive stages based on the Talmudic dictum by R. Phineas b. Ya’ir : “Study leads to meticulousness, meticulousness leads to zeal, zeal leads to cleanliness, cleanliness leads to restraint, restraint leads to purity, purity leads to holiness, holiness leads to meekness, meekness leads to fear of sin, fear of sin leads to saintliness, saintliness leads to the holy spirit, the holy spirit leads to life eternal. Saintliness is the greatest of all of these” (TB ‘Abôdâh Zârâh 20b). The author construes these principles as the stages of the spiritual path or ladder of ascension similar to those found in Sufi manuals. In this opening chapter, he specifies the prerequisites necessary to embarking upon the spiritual path. Having already discussed the initial prerequisite of knowledge, for ‘the ignorant cannot be pious’ (Aboth 2, 6), David Maimonides presents a very original interpretation of the term zehîrût (‘meticulousness’). In addition to its classical meaning of the ‘attentiveness’ which stems from knowledge, he lends it the sense of ‘enlightenment’. Interestingly, he uses as a locus probans the verse used in the opening passage of the Zohar, of ‘Book of Brightness’! However, David’s inspiration here is not Kabbalistic but Sufic, ultimately deriving from the ishrâqî or ‘illuminative’ spirituality of Suhrawardi (executed in 1191), for whom progress in speculative knowledge and spiritual illumination are intimately bound. Thus the starting point of spiritual awareness is a spark, an illumination which serves as a catalyser for the quest. This spark results from a meditative attitude – ‘constant contemplation of the angelic world’, ‘intense remembrance of God’, ‘subtle meditation of the world of sanctity’, – coupled with a corporeal discipline involving the reducing of one’s physical needs such as food and sleep. 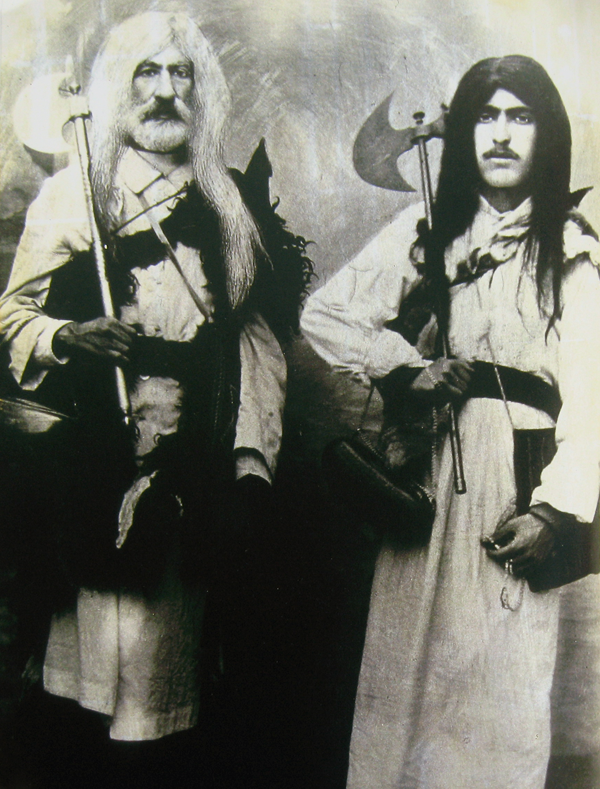 Jewish dervishes Agha-Jaan Darvish and his brother, patriarchs of the Darvish family. Tehran, Iran, c.1922. “Because of its specific association with Sufism and its ensuing identification with Islam, dervishhood is an order comprised almost exclusively of Muslim practitioners. The two Jewish dervishes pictured here in this rare photograph are among the very few who had successfully been integrated into the order without converting to Islam. Like the Jewish practitioners of a traditional Iranian sport in the houses of strength (zurkhaneh) — a sport that is profoundly intertwined with Islamic ritual — these dervishes represent a uniquely Iranian hybrid of Judaism and Islam. 1) The cloak, an outward sign of his state. 2) A kashkul (begging bowl) often made of such materials as mother-of-pearl. 3) A gourd, a coconut shell, or carved wood suspended from the wrist by a chain. 4) A tabarzin (short axe or hatchet) carried in the right hand and intended to fend off wild animals or highway robbers. 5) A chanta (patched bag) slung over the shoulder to carry essential items. 6) Takht-e pust (skin bed), a small mat made of animal skin that served as his bed while traveling. Photograph and caption from Esther’s Children: A Portrait of Iranian Jews, edited by Houman Sarshar. For more pictures from Sufis from the era – here. 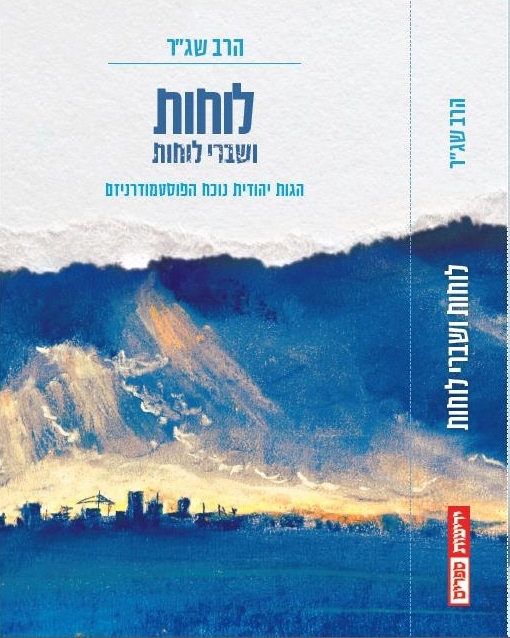 Recently, the committee publishing the works of Rav Shagar z”l published a collection of Rav Shagar’s writings on post-modernity in a volume called Luhot veShivrei Luhot (2013). The essays were given as talks during the last five years of Shagar’s life and appeared in various out of the way conference proceedings or Religious Zionist journals. I am still processing the other essays which directly relate to theology however, there was a free-standing essay given at Maaleh Film School in 2007 which deals with those who are leaving observance and becoming DATLASH, a Hebrew acronym whose initials stand for dati le’she’avar (formerly religious). Rav Shagar blames the parents and the establishment as opposed to those younger members who become Datlash and disassociate with Religious Zionism as he believes the latter has no choice in separating. Referring exclusively to Israel, he sees the generation of 1950s grandparents as having a tepid religion as part of their Mizrachi Relgious Zionsim. The children in the 1970s rebelled by creating the dedicated religious world of the Hesder Yeshiva, where everything was from derived directly the Book which thereby negated the living familial and communal religion. The grandchildren, having grown up with the sterile world of Judaism by the Book, were left with two choices: either increase the ritual obsession through becoming Hardal or give up the sterile religion by becoming DATLASH. Surprisingly, Rav Shagar thinks that Hardal is a relinquishment of the Relgious Zionist project of openness and fulfillment in the real world, while Datlash is a return to a basic sense of religion. Rav Shagar cites a study by Mordechai Barlev (1998) on the graduates of religious Zionist high schools and their leaving religion. Unlike the rejection of religion to become a secular Israeli (hiloni) of prior generation, here the problem is the influence of the modern world on religious youth. The Second movie is focuses on a rabbinical father, a member of the Gush Emunim settlement movement who was also part of the religious revival that came in the 1980s. The father is portrayed as dogmatic and rigid, therefore his son rebels. The symbolism of the movie is setting a dog free on Yom haAtzmaut to show the need for greater freedom and naturalism in Religious Zionism. Rav Shagar asks: What is nature of becoming secular (hilon) today? Our secular concepts of today are not those of once upon a time; the politics of today are not the Marxist politics of yesteryear. The new generation is something new, they are datlash. Today, unlike in the 1950s, one is not simply becoming secular from a loss of faith, an inability to believe in God, or even in the face of enticements or opportunities in secular world. It is just that religious Zionism is not relevant anymore in the lives of formerly Zionist youth; what we can see from the rise in datish is that religion slowly and reticently falls away. It is a social problem in which religion fell away from real experience. The Hesder Religious Zionist World is a community of arbitrating and evaluation every action because lives are to be conducted and lived by the book. Even lived faith and religiosity has loss all spontaneity in one’s quest to do what the book says. Today, according to Rabbi Shagar, we have lost all connection between the living voice of the prophets and the proclaimed political messianic age. The vision of Rav Kook once sustained the yishuv; now religion is an ideology. Some flee from it and others embrace the extra stringencies and obsession with modesty. Datlash and hardal are two sides of the same problem. The Hardal will end religious Zionism and the datlah only see part of the problem. Rav Kook spoke of a revolution, a Torat Eretz Yisrael, based on hagshamah (working the land), and today, we need to seek new values beyond the Shtible. Now religious Zionism became dogmatic, frozen, and uprooted from life. The artificial strictness causes its younger members to flee. The secular and religious are in continuity since most datlash are still connected to their religious home and upbringing. They form their own enclaves. Religion (Dat) is part of the name and very essence of datlash. The ex-religious group remains religious in social group yet give up belief and practice; however, members do not become completely secular like the 1950s.- Therefore there is continuity between religion and secular. The continuity is also found among the dati-lite who keep the social norms of kippah and synagogue even if they don’t pray or daven daily or say blessings. The difference of the two groups Datlash and Dati-lite is watching a movie on Friday night TV or the occasional travel on Shabbat. However, the real definition and distinction is self-identification. Rav Moshe Tzvi Neriah said about the earlier secularization, “I worry more when a boy takes off his kippah than when he stops putting on tefillin.” It is all a self-identification. The psychological differences are great even if tefillin is from the Torah and kippah is only a custom. The former is a loss of identification while the latter is only laziness. The datlash has no sense of victory or a new era or triumph; they know the grass is not completely greener on the secular side. There is a loss of religious identity more than a loss of halakhic observance (compared to the Dati-lite). This loss of identity is not just existential but also shown in body and society. There is a willingness to take off clothes in street, such as removal of a polo shirt which never done by a religious Zionist guy even if not technically forbidden. A datlash is not a removal of mizvot as much as a removal of restrictions. It is also the loss of connection to religious Zionist community. There is a removal of God and holiness from their frame of reference. For the sake of heaven (leshem shamayim) and sanctifying the physical as taught in religious Zionism is now seen as obsessive, rather than uplifting. Hardal is as oppressive as the Haredi society, and both think mizvot are the entire purpose of life. Rav Shagar says that light and dark are mixed in the lives of the datlash. Their throwing off the yoke gets them more in touch with life. They are now paradoxically secular but with a connection to religion. They are creating secular study halls or traveling on Shabbat to study midrash and hasidut. As it says: “It is better that they leave me but keep my Torah.” They are Datlash because they found the prior generation lacking and regain connection and identification with Torah, paradoxically by leaving. They need to leave to find holiness and cleaving to God. Datlash is in some ways more advanced or a more vanguard approach tothe religious Zionists community, one that lost its roots. The observance of the Datlash after they separate from Relgious Zionism is in some ways more connected to Torah and mizvot. Rav Shagar sees hope in them and their children for the true holy rebellion. There is much in this Israeli perspective that is different from the United States- on post-Orthodoxy-see here. Also in Israel, I must point out that there is an unpublished Hebrew PhD by Ari Engelberg that shows that indeed datlash is empirically a new group between religious and secular. His research shows that the historicity of the Torah does not play a big role for them. The Datlash have a new age holistic sense of religion, not in continuity with their former particularistic providential God of Yehudah Halevi and Rav Kook. Rav Shagar elsewhere in this book shares sympathy with a more universal holistic sense of God that he calls post-modern, but we will discuss that in a future post (or for those who live in Bergen county there will be a hug bayit on the sefer at my place Shabbat 5:45 for the next 5 shabbatot, excluding YK-contact offline). My publisher is finally getting around to issuing an inexpensive paperback edition of my book Judaism and Other Religions. My editor needs me to collect emails from professors or teachers who would want an inexpensive edition for classroom use. The editor has to collect them and submit it to the financial side of the firm. If you are interested in a paperback edition to come out this fall, then please send me a personal email listing your affiliation, not a comment.